Every spring Washington DC celebrates The National Cherry Blossom Festival at The Tidal Basin and Jefferson Memorial! The annual festival celebrates the 1912 gift of 3,000 cherry trees from the mayor of Tokyo to the city of Washington DC and honoring the friendship between The United States and Japan. Today the festival last about four weekends and attracts about 1.5 million tourist. The blossoms can be seen around The Tidal Basin, Jefferson Memorial, MLK Memorial, and many other areas. Many couples choose the Cherry Blossoms as the perfect time to plan their surprise marriage proposal or engagement session but there are some things to keep in mind! Dealing with tourist and large crowds: The Cherry Blossom Festival attracts many tourist! So avoiding the busiest times will be beneficial to make sure there is space to get photos without people in them. Sunrise sessions are highly recommended as there are not many tourist out just after sunrise. The later in the day the busier it gets. Going on weekdays instead of weekends is also helpful! During your session we can stop by some of the lower traffic locations to get shots without tourist in them. Peak Bloom: many clients like to have their photos during peak bloom! Peak bloom happens when 70% or more of the cherry trees blossoms are out. The peak bloom may only last for a few days but the week before or after the bloom will still have many trees in bloom. Peak bloom can be hard to predict especially if you are coming from out of town on a planned trip. If you are flexible on dates, I am happy to be flexible in planning spur of the moment to go during peak bloom for photography sessions! You can read more about peak bloom and up to date predictions on cherryblossomwatch.com. Peak bloom depends on the years rainfall and temperature. Transportation: As The Cherry Blossom festival attracts thousands of tourist it is recommended to use transportation such as Uber or Metro instead of driving as parking is limited! Metered Parking may be available if you are planning a sunrise session. Other Locations: Aside from The Tidal Basin and Jefferson Memorial there are other locations around Washington DC that also have Cherry Blossoms. The National Arboretum and grounds at The Capital also have Cherry Blossoms and other great views. Ask about other locations when planning. Some shots along the pathways around the Tidal Basin! The Tidal Basin and Jefferson Memorial are ideal locations for Cherry Blossoms! The Lincoln Memorial is a great spot to propose with a view of The Washington Monument! After the proposal you can walk nearby for Cherry Blossom photos! Surprise Proposal Photography includes detailed planning/advice, photography session to capture the proposal moment, portraits afterwards, and your online gallery of your beautifully processed high resolution images. The online gallery is easy to share with friends and family! You have heard it before; You should always have a back up plan or Plan B! This certainly holds true when planning a photography session for surprise wedding proposals and engagement sessions at an outdoor location. It is a very good idea to have an indoor location as Plan B, especially if you are not able to reschedule the date of your photography session. On the day of proposing, it could rain or during the winter months you could be faced with ice and/or snow! Washington DC has some great indoor locations and most have no admission fees. - If time is flexible, go as soon as the location opens to avoid crowds. The National Gallery of Art is a wonderful place for photography to capture your special moment. There are two buildings in addition to the National Gellery of Art. In one building you will find modern art and in the other building there are mostly classical paintings. Although both would be ideal, the building with modern art has more natural light. The LED Tunnel makes for a cool photograph! Open Monday-Saturday from 10:00am-5:00pm and Sunday from 11:00am-6:00pm. The National Portrait Gallery's Kogod Courtyard is located in the center of the building. This location is wonderful as it has a lot of space, natural light and indoor plants. Other parts of the gallery are great for portraits as well. During the holiday season the courtyard is quite festive! The Botanical Gardens are located right near the Capital Building. The walkway in the tropics exhibit is an ideal spot for your special moment as it tends to be more private and a there is a lot of natural light coming in through the windows. To add to your photos, you can end the photography session with a photo outside with the Capital Building in the background. The Botanical Gardens are open daily from 10:00am-5:00pm including weekends and holidays. The Library of Congress is another great place for photos with its beautiful marble floors and spectacular pillars. Once inside, you must go through security and then walk up to the main area. The top level is suggested as the best place portraits! Restaurant Proposal - proposing at the resturant where you went on your first date or a frequent date spot is also a popular choice. Restaurant proposals may require more advance planning and can be a bit restricted for portraits afterwards if its raining outside. Using the overhang outside the restaurant is an option or a bar area or other parts of the restaurant such as private rooms if the restaurant allows and has this option. National Building Museum - The National Building museum has an entrance fee but always has cool exhibits that can make for unique photos. Union Station - The front of Union Station has a great outdoor area that is covered by the overhang. Inside is also a great spot for indoor photos however Union Station can be busy during peak travel times. Hotel - A hotel room, hallways or the lobby area can be used as a great indoor location as well with the hotels permission. This works well for couples out of town staying in a nice hotel. Some hotels also have proposal packages where they will place flowers or a bottle of champagne in the room for you when you check in. 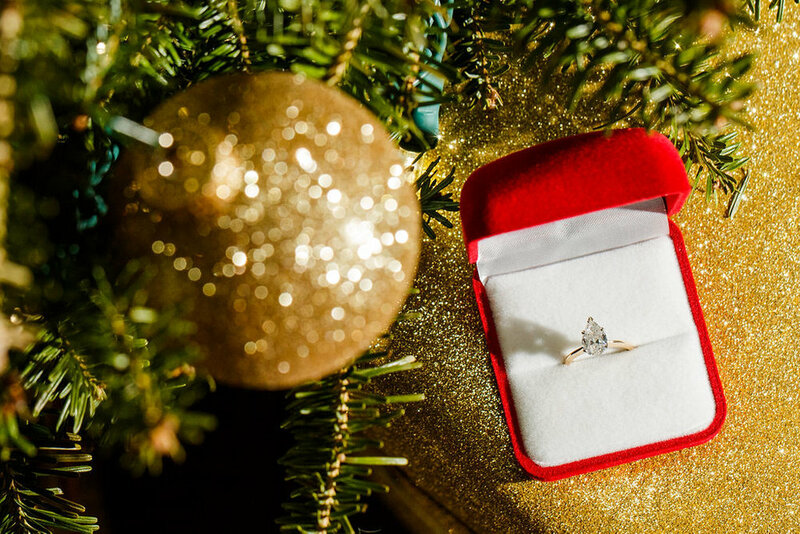 Below are some shots from The Ritz Carlton Hotel in Georgetown where I captured a surprise proposal during the holidays!